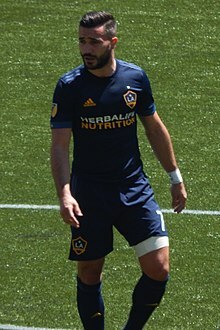 Romain Alessandrini (born 3 April 1989) is a French footballer who plays as a winger for Major League Soccer club LA Galaxy. Alessandrini spent six years of his youth career at Marseille. In 2005, he moved to Gueugnon making his debut in the third-tier Championnat National in 2008. In 2010, he signed for Ligue 2 side Clermont Foot, playing two seasons there. In February 2013, while playing for Rennes, was selected by Didier Deschamps to play for France but an injury which ended his season, prevented him from making his international debut. In summer 2014, Alessandrini returned to Marseille, joining from Rennes for a reported €5 million transfer fee. On 31 January 2017, he was signed by LA Galaxy as a Designated Player. Alessandrini is known for his pace, dribbling and eye for goal from midfield. ^ a b c "Transfer news: Marseille sign winger Romain Alessandrini from Rennes". SkySports. 25 June 2016. Retrieved 15 July 2016. ^ "Alessandrini: I never ease off". FIFA. 25 January 2013. Retrieved 15 July 2016. ^ "Stade Rennais. Rupture du ligament croisé pour Alessandrini, saison terminée". Ouest-France (in French). Retrieved 15 July 2016. ^ "Alessandrini staying cool". Ligue1. 27 February 2013. Retrieved 15 July 2016. ^ "LA Galaxy sign French midfielder Romain Alessandrini". LAGalaxy.com. LA Galaxy Communications. Retrieved 31 January 2017. ^ Romain Alessandrini at Soccerway. Retrieved 1 March 2018. ^ Chioffi, Stefano (3 January 2013). "Alessandrini, il francese più richiesto in Ligue 1". Corriere Dello Sport (in Italian). Retrieved 15 July 2016. ^ "Quand Alessandrini n'était pas taillé pour l'OM". Le Parisien (in French). 26 January 2013. Retrieved 15 July 2016. This page was last edited on 18 April 2019, at 07:22 (UTC).